Home News EBA presents the latest biogas production statistics for Europe – growth continues! EBA presents the latest biogas production statistics for Europe – growth continues! Despite the fact that renewable energy in general and bioenergy in particular is subject of head wind, 2012 was so far still a successful biogas year. Germany suffered tremendously under the new FiT with the result that only a third of new plants have been built when compared to the top year in 2011. Luckily enough, in other countries biogas is finally taking off the ground like specifically in Italy but also France and the UK. 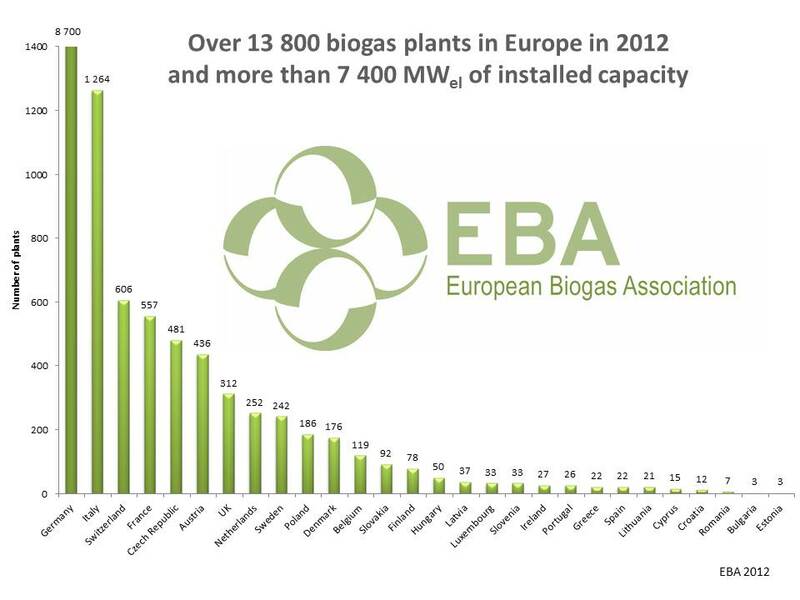 As of 2012 Europe has already over 13 800 biogas plants and more than 7 400 MWel of installed capacity. For biogas upgrading to biomethane, 2012 was by far the most successful year. The development is clearly led by Germany followed by Sweden. The trend will continue as there are up to 100 projects of upgrading plants under planning in France and another 20 are expected to be built throughout the coming year in the UK. Just a couple of weeks ago, our Italian friends were able to announce the new feed-in law allowing to finally inject biomethane into the grid, making sure that the deployment will become a success story also in Italy.